Vibrant Barcelona is known for its energy and style, with a plethora of arty museums, designer stores and tapas bars waiting to be discovered within the city's winding streets. Check out Antoni Gaudí’s amazing urban Parc Güell in Gracia, or the lush Parc de la Ciutadella, and be sure to visit the stylish boutiques and bars of El Raval. Spend time at the city’s harbour, which is home to several parks and beaches. To truly discover Barcelona, explore La Rambla, a lively street that divides the old town into the Barri Gòtic and El Raval areas. The sun-kissed party island of Ibiza sees nearly six-million tourists a year, thanks to its legendary bars and clubs, gorgeous sandy beaches, historical towns and inviting crystal-clear waters. The Unesco-listed Dalt Vila, where the ramparts look out over Formentera and which is beautifully flood-lit at night, is worth a visit. For relaxing days soaking up the sun, head to the popular resort of Playa d'en Bossa, where you can rent a kayak, go jet-skiing or simply lounge on a long stretch of sand - lined with lively bars where you can go dancing once the sun sets. The idyllic Balearic Islands of Formentera, Ibiza, Menorca, and the capital Majorca, make a perfect summer and winter escape. While Ibiza is known as the party island with its hip bars and nightclubs, tiny Formentera is great for a quiet getaway, with long stretches of white-sand beaches to relax on. 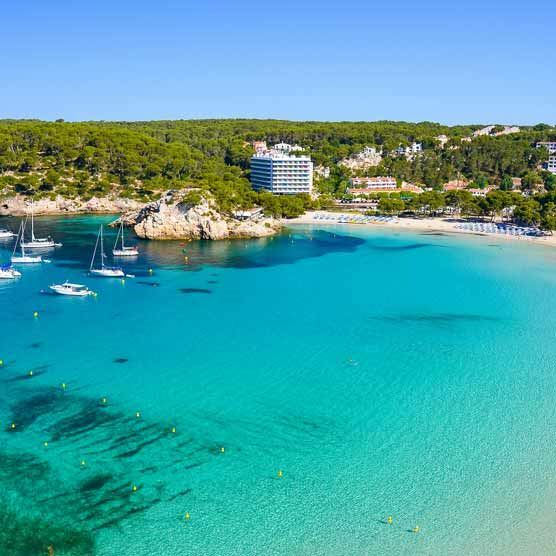 Menorca offers a pristine coastline where you can enjoy a laid-back beach holiday with a side of history thrown in too, while Majorca is popular for its modern resorts, hiking trails in the Serra de Tramuntana mountain range and of course, fab beaches. Want an exciting city break? Head to Palma for a long weekend and discover the beautiful port of Ciutadella. Spain’s lively capital of Madrid is buzzing with art, tapas bars, beautiful gardens and lots of markets. Visit the Prado Museum to view art created by the masters, like Goya and Velazquez, take a tour of the grand Royal Palace, or rent a paddleboat at the popular Retiro Park. Shopping enthusiasts will love the Salamanca neighbourhood, lined with small boutiques and international luxury brands. The Rastro flea market is also a great place to discover antiques or enjoy a drink at popular Museo de la Radio Bar. For more, check out our guide on things to do in Madrid. Discover the spectacular sand dunes of Fuerteventura, volcanic beaches of Tenerife, lush landscape of Lanzarote’s Timanfaya National Park and natural beauty of Gran Canaria when you head to the Canaries. The Canary Islands boast 3,000 hours of sunshine a year, with golden sands and crystal-clear waters that are fantastic for beach holidays with the family or a loved one. If you love watersports, there are several surf schools you can join right on the beach such as Kalafu and Kaboti in Lanzarote, or indulge in a little retail therapy in Gran Canaria's Las Palmas. Spain’s 5,000 mile-long coastline is dotted with thousands of serene coves and expansive beaches, with nearly 600 of them boasting Blue Flag status - so you'll have a variety of lively beach clubs, quiet bays and gorgeous sunsets to look forward to. Favourites include the Costa del Sol, Costa Blanca and the charming Costa Dorada. On the islands, Fuerteventura's resort of Corralejo is a haven for diving, kiteboarding and windsurfing enthusiasts, while in northern Spain, the Costa Brava boasts soft golden sands, tinged with coral pink rocks. Ticking the natural beauty box are the grand dunes of Maspalomas in Gran Canaria, which are definitely worth a visit. Check out our blog for what's cool about the Costas. It's no surprise that Spain has a bustling nightlife, with world-famous clubs in Ibiza, the lively lounge bars of Madrid and buzzing streets of Barcelona. You can start with a tapas bar crawl and end up dancing into the early hours. The streets are packed with bars, which offer something for every mood. In the summer, it's Mediterranean coast beckons with beach parties and clubs, in hotspots like Marbella, Puerto Banus and beyond. The Spanish take their food seriously, whether it’s the divine 'pa amb tomate' (grilled bread, with flavours of tomato and olive oil) served at the numerous tapas bars or chorizo (smoked pork sausages), albóndigas and pork meatballs - wine is always on the menu too, of course! Check out a variety of restaurants and bars across the cities and coastal resorts, where you can enjoy sangria on the beach or dig into large helpings of paella and tortilla - delicious.